How do you choose at random from an arbitrarily large number of options? Choose a creature at random, then destroy the rest. 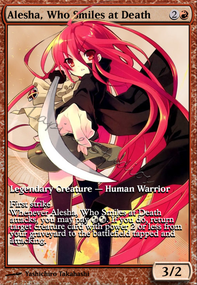 Alesha is definitely best gril, one of the more interesting build-around Mardu commanders (unlike Queen Marchesa who's really convoluted and difficult to build properly for, and Kaalia's brutishly straightforward game plan). 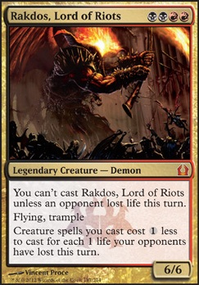 If I can make some suggestions, Balthor the Defiled helps the reanimation plan, Last One Standing gives you a much-needed boardwipe, and Kambal, Consul of Allocation is serious enough of a threat that it sees vintage play, and it'll gain you wayyyy more life than you might think. Nice deck, I do have a few suggestions though. Cyclonic Rift and Chaos Warp especially to deal with enchantments. Sol Ring and Mana Crypt (I know, triple colored mana in Marchesa, but it still allows a lot more synergy on board leading up to her). Last One Standing is a great boardwipe here that gets under Gaddock (I prefer this over Fire Covenant honestly). I have a few suggestions for you. I'll try to break it down by category. Sac Outlets - Yahenni, Undying Partisan and Falkenrath Aristocrat because hastey (immediate +1+1 counters) sac outlets that can protect themselves are really good here. Haste Enablers for immediate +1+1 counters - Urabrask the Hidden and Ogre Battledriver . ETB abuse/Immediate +1+1 counters - Sage of Fables (card draw and curves into and protects Marchesa) and Metallic Mimic to abuse etb's 4 times per round in a 4 player game instead of just once (i.e. Vindictive Lich over and over). Removal/Boardwipes - Replace Bontu's Last Reckoning with Last One Standing ... that downside is so much smaller. Flayer of the Hatebound is removal, life manipulation (hit yourself as needed), and combo. It can be sacced 8 times per round w/ 4 players for 36 damage per round (44 damage with Goblin Bombardment, 52 with Ogre Battledriver, and 60 with both). Card Draw: Midnight Reaper and Grim Haruspex . Feel free to check out my list for ideas. 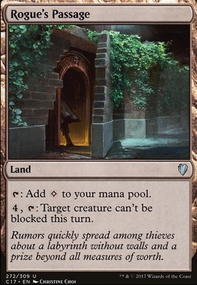 Less emphasis on theft but the deck is fairly competitive and I've played it for several years. Feedback, Upvotes, and/or Ideas on any of my decks is appreciated. Every Masochist Needs a Marchesa To Love Them. Hey, been playing Mairsil for a few months now and here to offer some suggestions. But I also have some questions. 1: Are you married to infinite mana combos? MY experience is that they are ineffective because they require perfect hands. And due to your budget limit I would imagine Demonic and Vampiric Tutors are out of the question. Ditto Intuition. It's too bad because these three would really enable artifact based combos to be assembled easier. Of course there's Fabricate or Whir of Invention but these are sub-optimal to Black tutors which fetch anything you want. Board wipes for example, which are SO important in a Mairsil build. You should also run Mystical Tutor as it's within your budget and fetches maybe the most important card in the deck (Buried Alive) Also, DEFINITELY play Gamble is you're not running the black tutors. If there that doesn't care about the discard, this is it. Card Draw: First off: Fact or Fiction is your best friend. 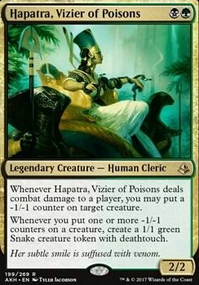 This is literally the best card draw card in Magic for this Commander. The reasons for which are pretty easy to see. As another commenter on Reddit said: Wheels. Wheels. Wheels. 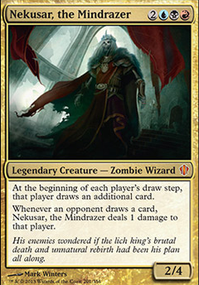 Windfall , Magus of the Wheel , but Jace's Archivist and Whispering Madness most of all since they can be stapled to Mairsil for further wheeling. You want to be POWERING through your deck. Especially since you are not/ cannot get the high end, low CMC tutors. For additional evil, add Legacy All Star Notion Thief . "Flash in Notion Thief at the end of your turn. My turn. Windfall. We all discard your hands. I draw 28 cards...you guys draw none" A few of the loot effects are fine for the extremely early game but I'd keep 3 max and replace the rest with FoF's and wheels. Counters: I would lose anything with 2 Blue in the casting cost in favor of things like Intervene . Keeping as much Blue open as possible for Aetherling and Quicksilver Elemental's abilities to be activated when needed. Negate is also a strong pick as, largely, your opponents creatures shouldn't be of much concern to you. 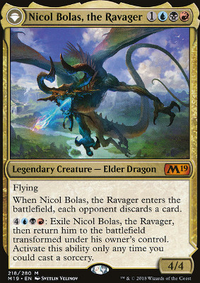 You are mostly concerned with countering instants that try to kill Mairsil in response to an ability activation or, frustratingly, people attempting to counter Mairsil. To be specific put in the two cards I suggested and take out Counterspell and Wizard's Retort. You convinced me to test out Olivia, Mobilized for War , aldo i am still a bit scared to throw away cards for getting a counter. I currently have 3 board wipes (living death and cyclonic rift not included) i might also give Last One Standing a chance to preform. As i only have about 5 repeatable sacrifice outlets i was wondering if you tested out Bloodflow Connoisseur ? Chaos Warp 100% deserves a spot as our best answer to enchantments by a long shot. Last One Standing and Jokulhaups are both excellent here. Metallic Mimic , Baleful Strix , Midnight Reaper , Oona's Blackguard , Ogre Battledriver , and Urabrask the Hidden all deserve spots (you're very light on creatures currently.) and I'd look mainly to your spot reumoval/counterspells for cuts. to give lots of feedback learning is what I am here for! Last_Laugh Your feedback has been incredible thanks a lot, although I am largely trying to avoid artifacts (too much removal) Last One Standing and Jokulhaups will be incredible additions, and I will be using your awesome deck Every Masochist Needs a Marchesa To Love Them as reference, I encourage anyone reading this to . 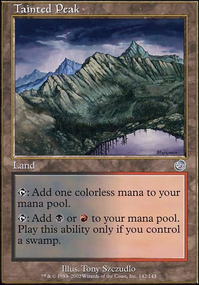 Jaypay1994 Thanks for pointing out the land issue I didn't even notice lol, I swtiched out a ton of the tap lands for basics and nontapping split lands. All the tap lands that gave me little to no benefit are out. Next time I go to my local card shop I will absolutely pick of Burnished Hart and also I think the other best thing for my deck is Solemn Simulacrum (Since it is ETB), plus Ashnod's Altar will serve me very well. Don't forget to throw an upvote my way so more people can see it and people will give Marchesa the love she deserves. Please everyone feel free to mention things that I should remove, it is really hard to pick what needs to come out when a deck feels like your baby, as I am sure you all know. 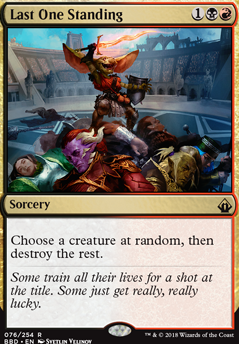 No etb's but you need Boros Signet , Rakdos Signet , Orzhov Signet , Fellwar Stone , Talisman of Indulgence , and Talisman of Dominance . Also consider Last One Standing and Jokulhaups .